Thanksgiving is a special day for gathering with friends and family. 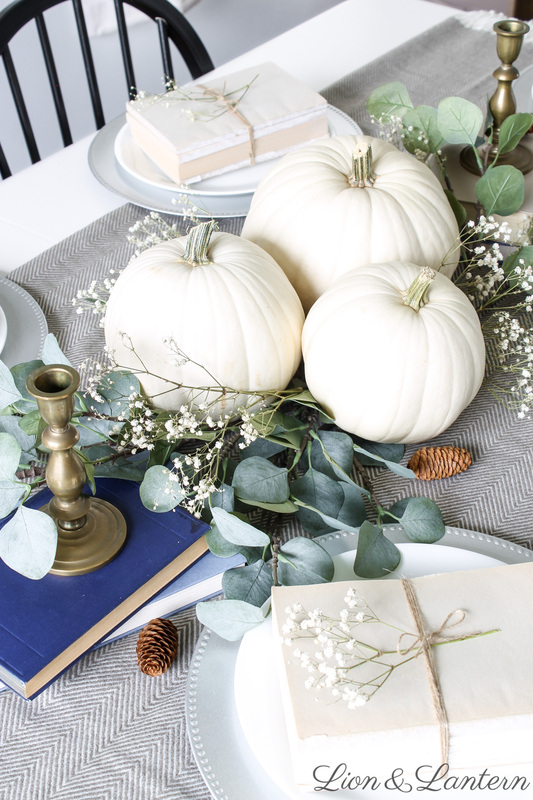 Make your Thanksgiving table especially warm and welcoming with simple decor such as white pumpkins, eucalyptus, antique candlesticks, and book bundles. 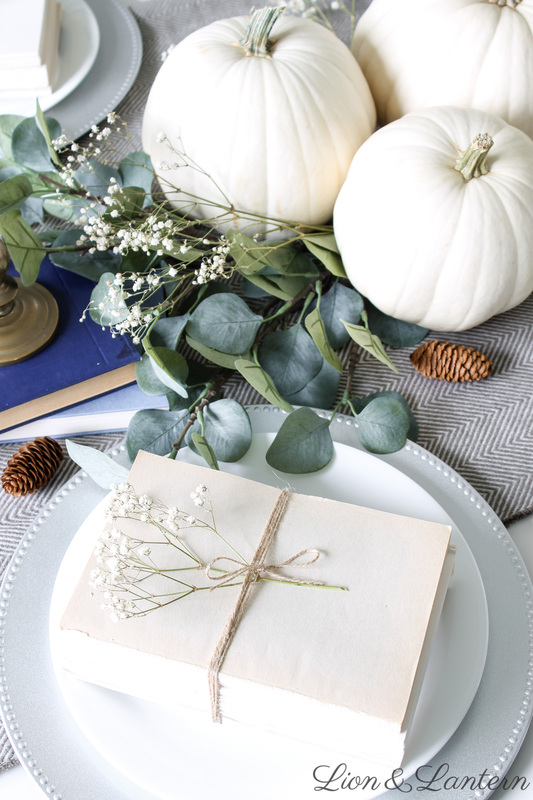 This tablescape is classic AND budget friendly! Hello dear friends! 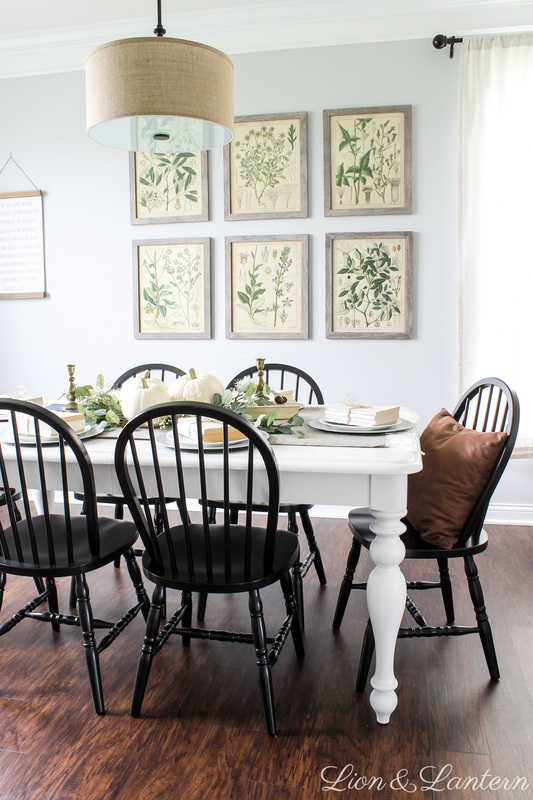 Today I’m excited to share our dining room styled for Thanksgiving. 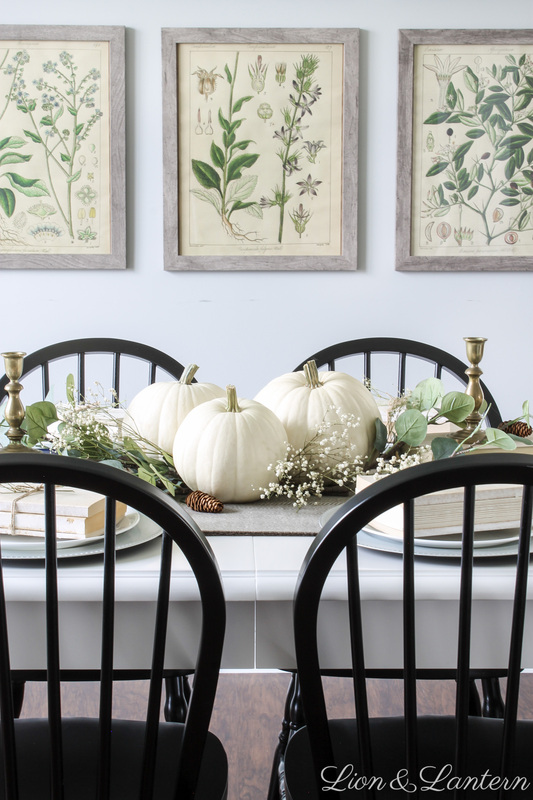 If you follow me on Instagram you may have seen snippets of this tablescape during our Thanksgiving Decor Tour, but I’m excited to share a few more tips, and a lot more photos 😉 Grab a cozy mug of coffee or tea and let’s get started! 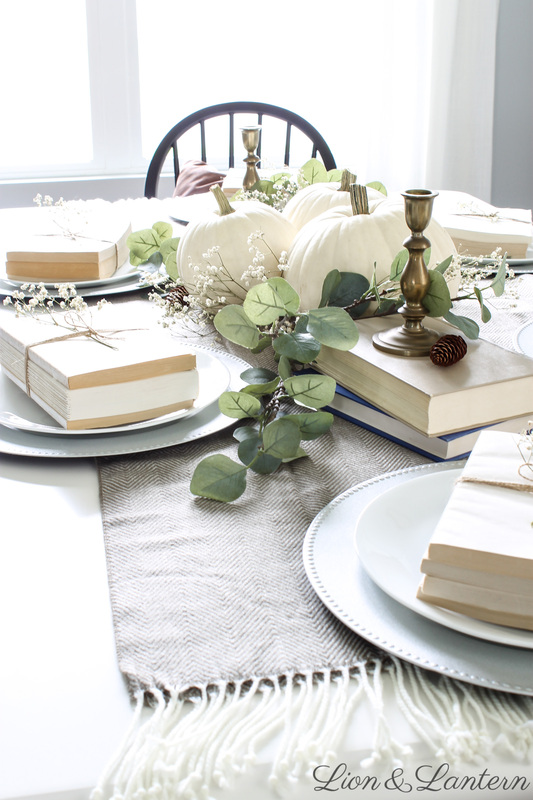 For this tablescape, I really focused on staple decor pieces that I already owned. 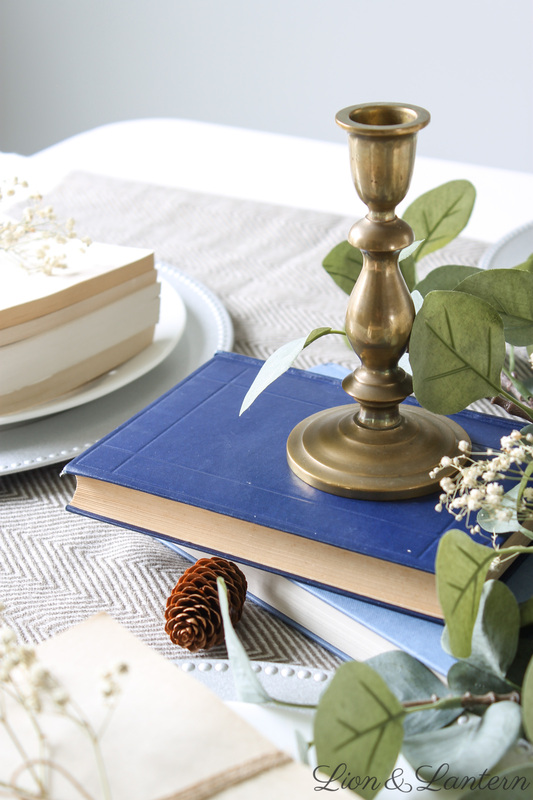 Some of my go-to decor items are blankets, books, greenery, and candlesticks (these brass ones were only a few dollars each from Goodwill!). For my centerpiece, I used my trio of white pumpkins for the main attraction. 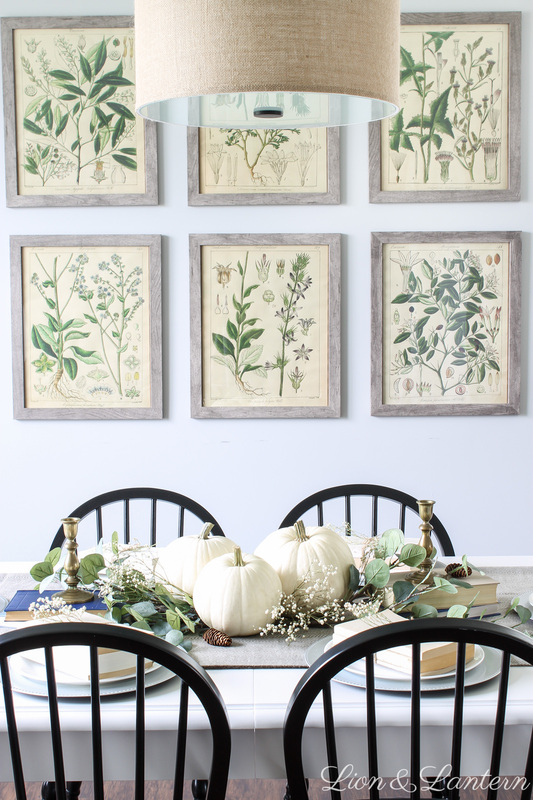 You’ve probably noticed them all around our home this fall, and I was happy to style them one more time for Thanksgiving! You could also use gourds or a basket of fresh apples or pears for an inexpensive centerpiece. Finally, let me tell you a secret… these silver plate chargers are from Dollar Tree! (That’s right, they were only one dollar each!) I love the snazzy plate chargers from other stores, but I didn’t have a large budget for Thanksgiving decor, and these offered a pretty but inexpensive solution. 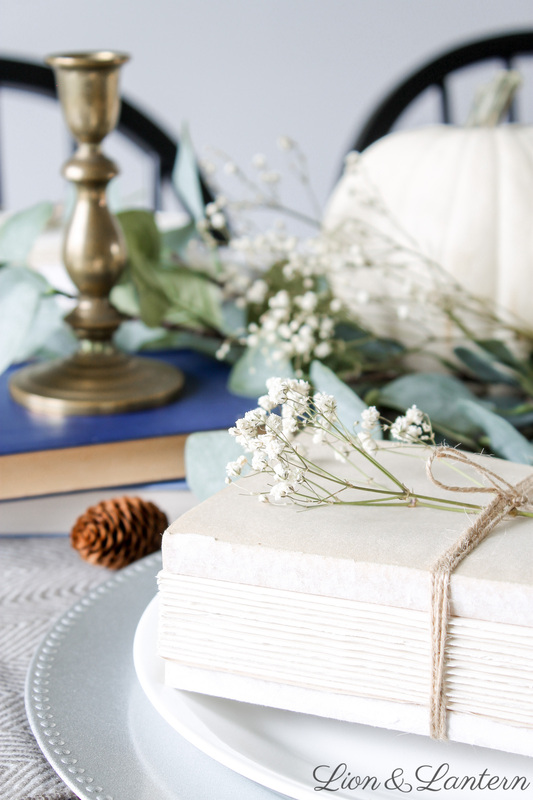 You’ve probably noticed that my Thanksgiving table features another one of my favorite decor items, these DIY book bundles! 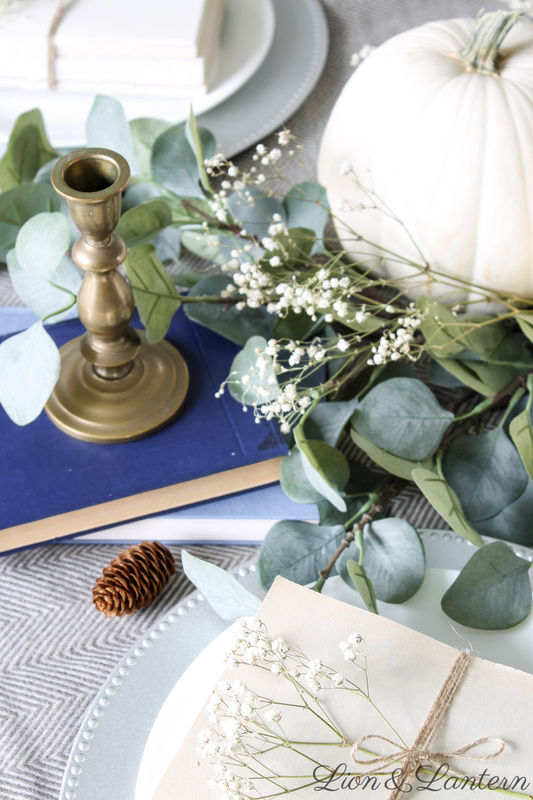 In my tutorial I shared how you can style these in so many ways, and this is just another option 🙂 They add an unexpected and whimsical touch to an otherwise classic tablescape. I also used books for a pop of color for our table. 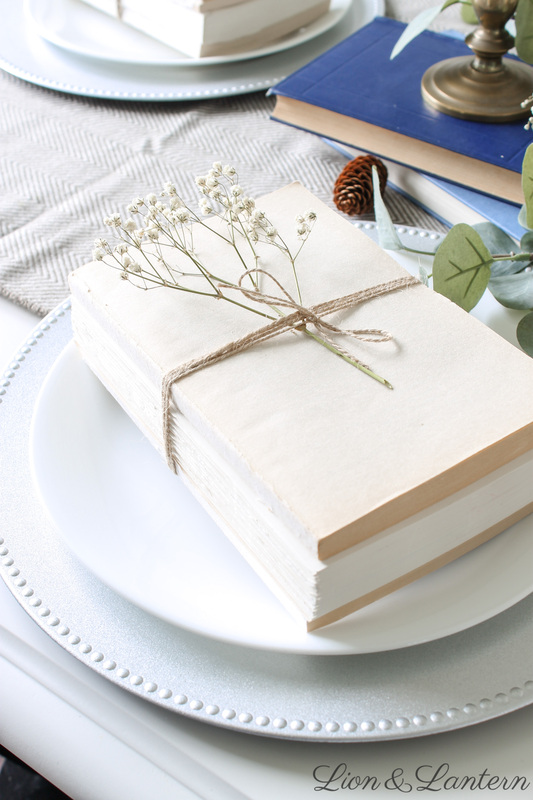 Again, books in a tablescape might seem a little out of the ordinary, but I needed to fill out the space so I got creative, and I think it worked! Don’t be afraid to experiment with unexpected pieces. I find that dining rooms can feel a bit stark sometimes, at least mine does! We do not have a rug right now, because toddler life 😉 But I discovered that adding a few throw pillows and a blanket warms up the space and welcomes guests in. 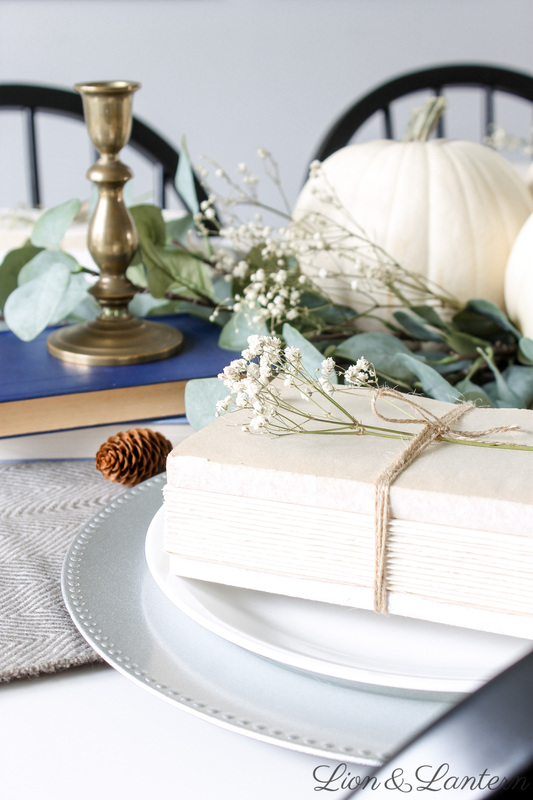 A final way to add warmth to your Thanksgiving tablescape is with a table runner. But let me tell you another secret–this is actually an inexpensive blanket from Walmart! I just folded it in half before laying it on the table. Thanks so much for stopping by today, friends! 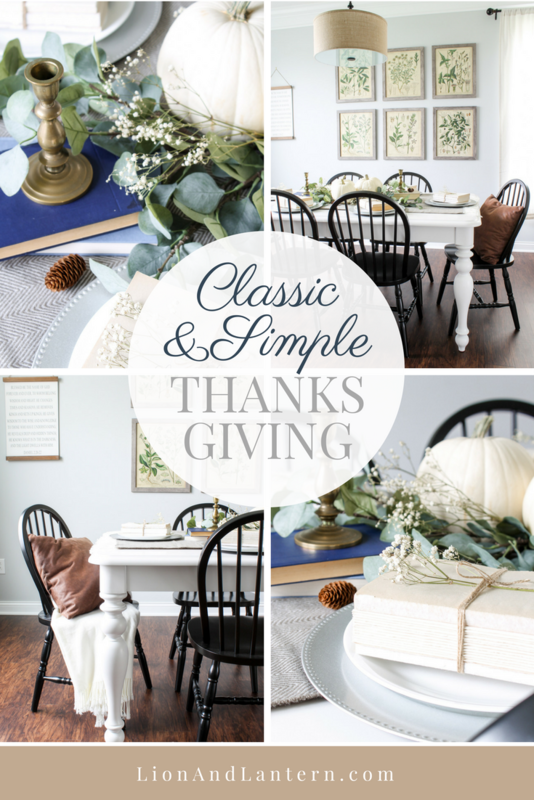 I hope this post inspired you with some ideas to make your Thanksgiving table classic, creative, and cozy (that wasn’t planned, but the English major in me couldn’t help it!). What are you doing for Thanksgiving this year? 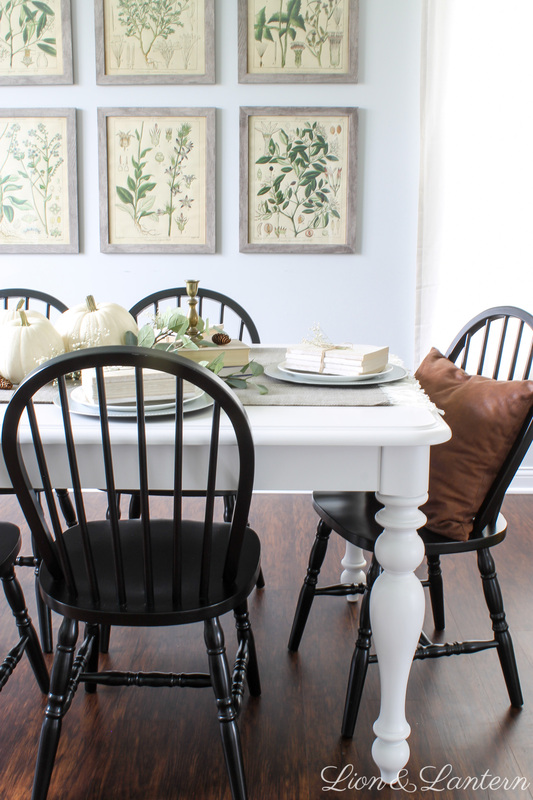 Do you have any decorating tips of your own? If you would like to save this post for later, pin this! 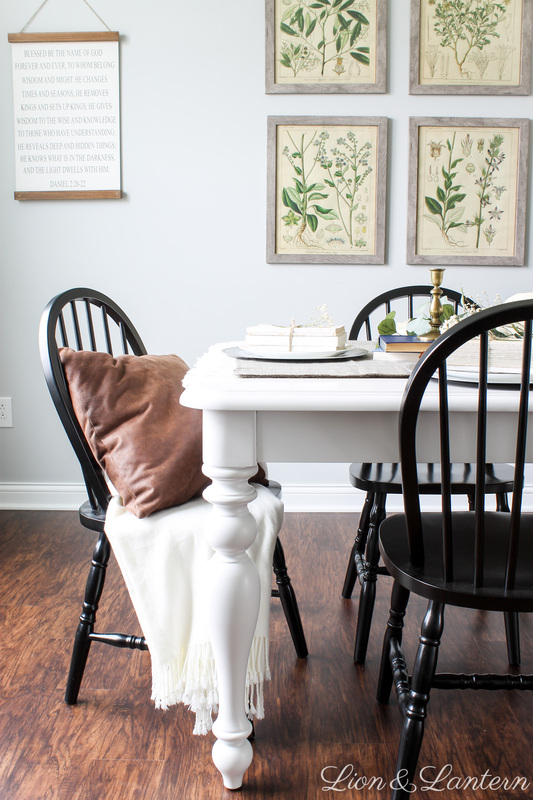 And if you are interested in the sources for some of our dining room staples such as the table and chairs, I shared them at the bottom of this post. Thanks again for stopping by! 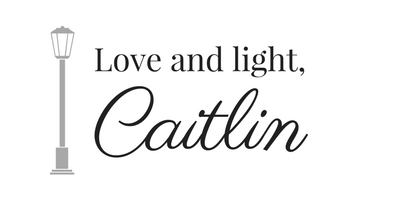 To stay up to date on my decorating adventures, sign up for my email list on the side or bottom of this page 🙂 I don’t have it quite up and running yet, but I will be sending weekly inspirational emails!